Development must meet federal and state regulatory requirements. NGA: pipeline infrastructure development is needed in the region to meet market demand. The Northeast's natural gas industry is striving to move forward with infrastructure projects designed to meet growing market demand. 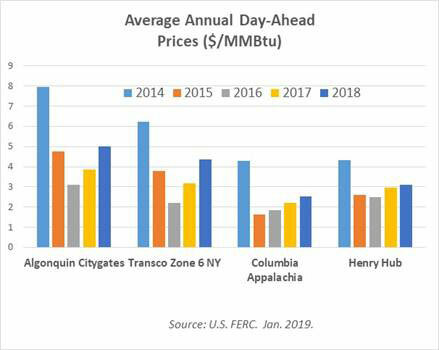 There is substantial growth in natural gas supplies within the Marcellus Shale basin on the border of the Northeast region (NY, NJ and New England). Even so, getting these new supplies to market requires further natural gas pipeline infrastructure investments, which requires incremental contract commitments. The Northeast natural gas pipeline system region remains constrained at several key points - particularly into the New York City area/Long Island and New England. New supplies and infrastructure will help to ease those constraints, and should help to improve the regional price situation. The multiple projects all center around bringing Marcellus Shale supplies in Appalachia to market. These projects are designed to help further increase regional natural gas capacity, deliverability, flexibility and reliability, as well as provide economic and environmental benefits to the region. In addition, there are planned system expansions on local utility systems to meet growing demand for natural gas - at the residential and commercial/industrial levels. The natural gas delivery system is designed to fulfill its contractual arrangements. 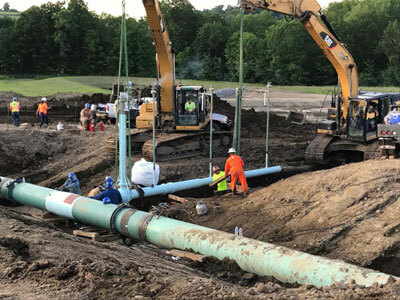 Pipeline capacity is added to meet the needs of gas customers requesting primary firm service and who are willing to execute firm transportation contracts that pay for the required capital investment and operating costs. Without such commitments and arrangements, projects cannot proceed. "The adequacy of the natural gas infrastructure is based on its ability to fulfill its contractual commitments. Natural gas may be contracted on a firm or interruptible basis. Interruptible contracts are typically less expensive because capacity is only paid for if used, and the supplier or transporter may interrupt service. The natural gas infrastructure is considered adequate if firm commitments are met and terms of the interruptible contract are satisfied." However, natural gas pipeline companies do not design or build pipeline projects based on the assumption that there will be a future market for transportation. Capital investment by pipelines must be supported by revenue certainty through firm service agreements. Upgrading and expanding facilities, such as compressor stations, along an existing route. 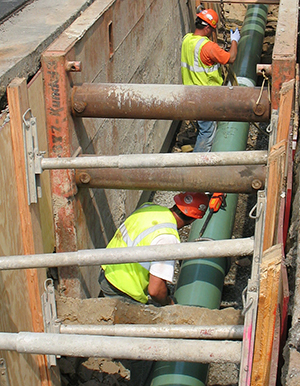 What are the Stages of Pipeline Project Development? There are several stages of project development. The following is adapted from a U.S. EIA paper. Phase I: Market Assessment and "Open Season"
If enough interest is shown, sponsors arrive at preliminary design. Phase 3: Filing with regulatory agencies - federal, state, etc. Photo credit: Iroquois Pipeline Operating Co. The process from initial development to commissioning can take from 3 to 5 years, and sometimes even longer. The Federal Energy Regulatory Commission (FERC) is the lead permitting agency for interstate pipeline projects. FERC is an independent agency that regulates the interstate transmission of natural gas, electricity and oil. In addition, projects require certain state (and sometimes local) permits, particularly in environmental matters. The U.S. EIA observes: "A FERC review of an interstate pipeline project takes from 5-18 months, with an average time of 15 months. No data are available on the average time for obtaining approval from an individual State agency. Usually, approval by the regulating authority is conditional, but most often the conditions do not constitute a significant impediment. The project sponsor must then either accept or reject the conditions or reapply with an alternative plan." The Marcellus supply production and the related infrastructure development offer great opportunities to the economy and environment of the Northeast. This region remains one of the most highly-populated, highly-priced and yet most highly-constrained gas markets in the U.S. These supply and pipeline developments have the potential of transforming the traditional paths of supply sourcing into the region, creating a more diverse supply mix and a more varied delivery network.